​North Bristol SusCom formed in 2012 in order to positively contribute to solutions to the transport issues in our area. We track the impact of our strategic influence on the transport investments in North Bristol and the effectiveness of our mode shift activities on commuting patterns within our businesses. We supported and input into plans or the creation of the West of England Combined Authority (WECA). WECA was created in 2017 as part of the wider West of England devolution deal. It will allow the Greater Bristol region to create a long-term vision, attract more funding and work more effectively across administrative borders. We are working closely with WECA, especially in the development of the Join Local Transport Plan, to ensure the future transport agenda for the region tackles congestion and facilitate more active and public transport investment. We linked up with key national level organisations including Greener Journeys to explore the best ways to collectively campaign for the creation of a national Bus to Work Salary Sacrifice scheme and ability for employers to subsidise bus travel. We established that this project will require protracted engagement at the national level. We are continuing to take this forward in our 2017 - 2020 strategic priorities and are looking to facilitate renewed action from local and national campaign organisations. 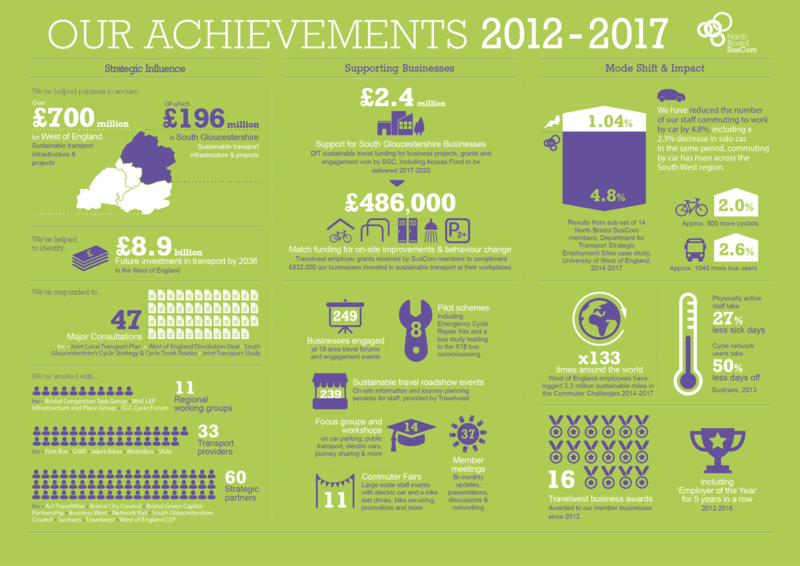 We supported and helped shape the West of England's successful Access Fund bid, securing revenue funds - funds that can support engagement work like ours - for business support until 2020. Throughout our work we will continue to build the case for revenue funded measures and the need for high quality public engagement to accompany all capital investment programs. We will work with our partners to secure funding beyond 2020 through the Joint Local Transport Plan and upcoming funding opportunities. We fed into the creation of South Gloucestershire Council's Cycle Strategy, developed in 2016. There is still a need for a Greater Bristol-wide vision and strategy covering all active modes to ensure improvements can be taken forwards at every opportunity and do not stop at administrative boundaries. We want to see ever closer alignment and integration of the four West of England Unitary Authorities' strategic plans for active travel. WECA and the new Joint Local Transport Plan are key opportunities to realise this. Annual staff engagement activities: we increased participation in the annual Travel to Work Survey and Commuter Challenge, collaborating closely with Travelwest to ensure both schemes were more effectively delivered for our businesses. Individual company action plans: we helped member businesses develop bespoke individual company action plans, aligned with Group Travel Plan priorities. In Spring 2017 we successfully introduced auditing and action planning support for member businesses which we continue to offer. Regional support services: we continued to work closely with regional partners including South Gloucestershire Council to refine travel support services for businesses such as Join my Journey car and journey sharing platform, the Travel to Work Survey and the Active Travel Champions network. In 2016/17 we delivered a series of area business engagement events, engaging 208 companies and capturing feedback on the major transport issues and opportunities for 9 employer clusters. Membership engagement and sharing best practice: we maintained a strong network of members and facilitated regular experience sharing on topics such as parking management and electric vehicles at our members meetings. We created a series of member guides on promoting car share, running events and parking management and ran an intensive campaign to help members manage the impact of the Bromley Heath Viaduct roadworks. Pilots and innovation: We facilitated numerous pilot schemes of potential value to our members including behaviour change research, a business travel shuttle bus, shared electric pool cars and the Department for Transport's Strategic Employment Sites case study evaluation. During our last Group Travel Plan we worked closely with UWE Bristol on the Department for Transport funded 'Strategic Employer Sites' case study to develop an understanding of the impact of our activities. "In the Bristol North Fringe, car alone mode share for commuting fell by 2.3 percentage point (and total car mode share by 4.8 percentage points) [...] mode share increases were observed for bus use, cycling and walking." 'The fall in car mode share in the Bristol North Fringe is striking when compared with background trends in the South West region, which saw an increase of 1.04% in total mode share between 2013 and 2015." "Various sources of evidence have been used explain the modal shift in Bristol North Fringe. These show that reduction in parking availability was the primary factor for reduced car alone commuting in Bristol North Fringe with LSTF [Local Sustainable Transport Fund] measures facilitating individuals using alternatives to car commuting in this context." North Bristol SusCom businesses achieved a 4.8% reduction of staff commuting to work by car. In the same period, commuting by car across the South West rose by 1.04%. We achieved a 2.6% increase in commuting by bus and a 2.0% increase in commuting by bicycle, average across our member businesses.